! AV is an intracranial audiovision instrument made up of a helmet connected to an electronic circuit. To perceive sound and images, it is necessary to cover your ears and close your eyes. A droning sound recorded as a tape loop in a Cassette is heard through transducers (also called drivers or actuators) that transmit the sound vibration directly to the skull, which functions as a resonant box. The tonal variation of the sound corresponds to the control of the speed of the motor that rotates the cassette. The light patterns are generated by a line of LEDs and are generated randomly selecting colors, ignition sequence and repetition speed from time to time, making each session unrepeatable. How is it that these images are perceived in the brain? In the retina there are cells called photoreceptors that are responsible for capturing the visual information from the outside and transmitting it through the optic nerve to the brain. When a prolonged exposure is made to a light source or certain colors are fixedly displayed, saturation of the photoreceptors occurs. It will take some time for the image we see to disappear little by little. In the case of !AV, the stimulation of the photoreceptors is possible through closed eyelids due to the proximity of the light source (array of LEDs). The formation of these vibrant geometric structures is caused by the repetition at high speed (in the order of 3 to 25 milliseconds) of the various lighting patterns generated by programming, during a sustained period of time. The audiovisual experience is intriguing, due to the suppression of the perceptive channels (eyes and ears) and their consequent alteration in the conception of space, depth, color, and sound. Some people find it fascinating, others disturbing. The fact that images and sounds perceived by the brain are impossible to record or document, motivate participants to describe the experience using previous references such as mandalas, geometric patterns present in different native cultures of the world, video feedback and generative art among others. ! AV asks if it is possible to access altered states of consciousness (such as those caused by deep meditation, synthetic drugs or ethnobotany) through low technologies. Expanded reality as an alternative to virtual reality and its entertainment devices. 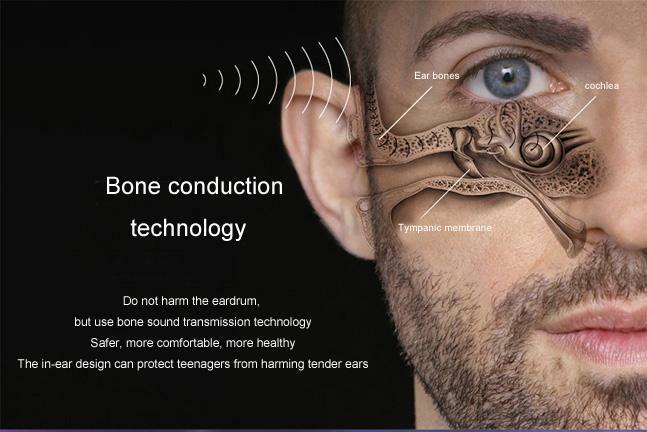 Visual explanation of how sound is percieved using bone condution technology, bypassing the eardrums and stimulating the cochlea directly.